Filling in some of the holes in my movie viewing history, I recently watched Alfred Hitchcock's classic, Notorious. As Roger Ebert notes, it "contains some of the most effective camera shots in his--or anyone's--work" and so I figured let's take a closer look at some of those great shots. Some are more famous than others, and I'm certainly going to leave off a few, but this should be interesting. Major spoilers ahead, mostly below the fold. First up is a minor shot, not really significant among the Notorious scenes, but more significant of Hitchcock's work as a whole. 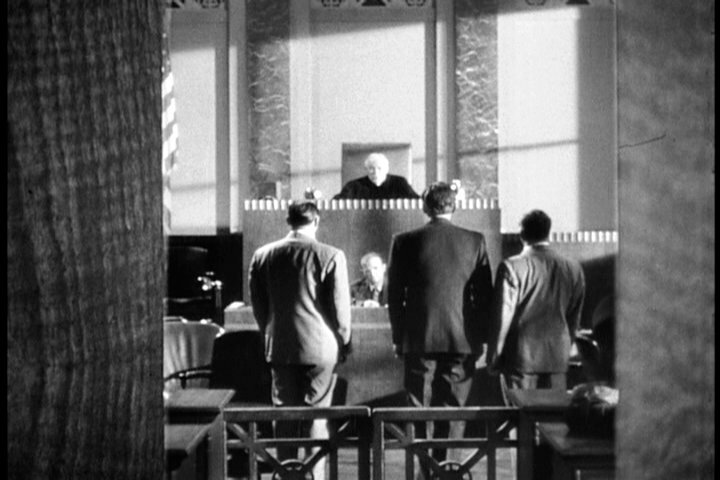 Many of Hitchcock's films indirectly employed the use of voyeuristic framing to make the viewer feel like they are witnessing the events portrayed on screen. The shot below is literally framed in a doorway, and the distance from the actors implies that we're not supposed to be there. It's an unsettling technique, one which Hitchcock would reprise effectively in his later classics Psycho and Rear Window. 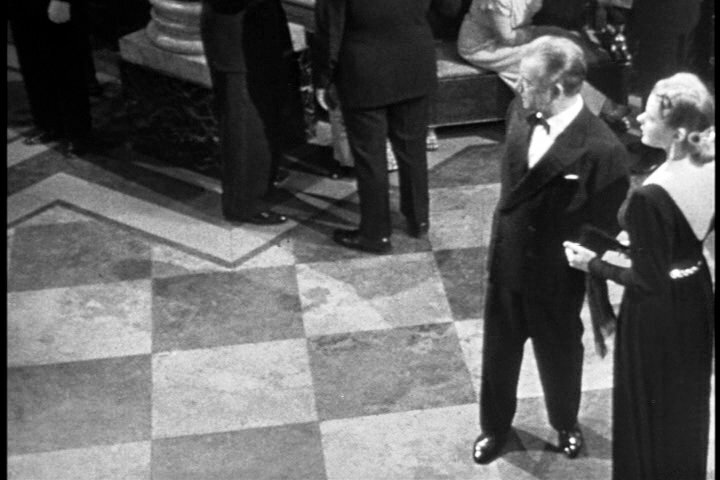 This dynamic is reversed in Notorious during the final shot of the film in which our villain is called back to his house to meet a fate we are only left to imagine, as Hitchock closes the door. Interestingly, both approaches can be upsetting: one because we see something we think we shouldn't, another because we fill in the blanks with our imagination. More screens, commentary, and spoilers below the fold... I've included several screencaps of the next shot to convey the motion on the screen, but looking at screencaps really doesn't do it justice. Ingrid Bergman's character has just seen her father imprisoned for treason, and has spent the night drinking. 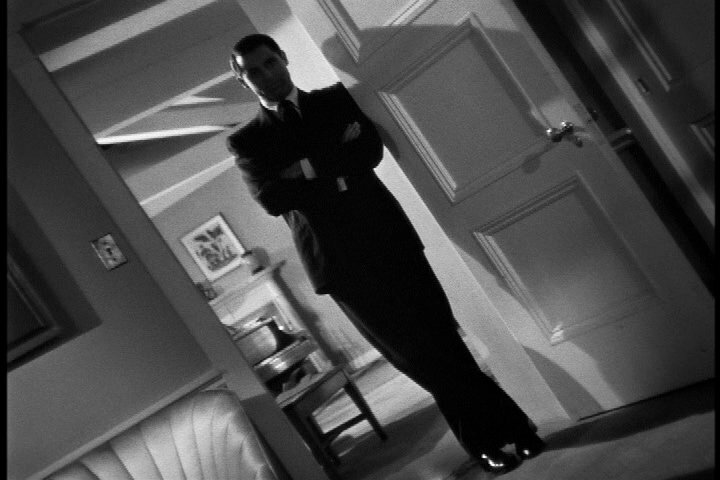 The scene starts with an establishing shot of Cary Grant, shrouded in shadows and leaning in a doorway (and also Ingrid Bergman laying in bed, waking up with a headache). 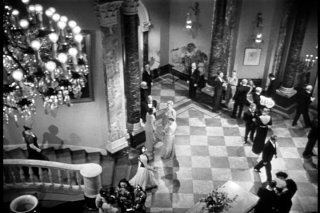 Hitchcock then follows Grant in a dizzying point of view shot as he walks across the room, the camera rotating as he moves, until he stands above Bergman. The oblique angles of these shots suggest anxiety and tension, and they underscore not only her hungover state, but also the turbulent state of her life. This technique calls attention to itself, but does not overstate the situation. 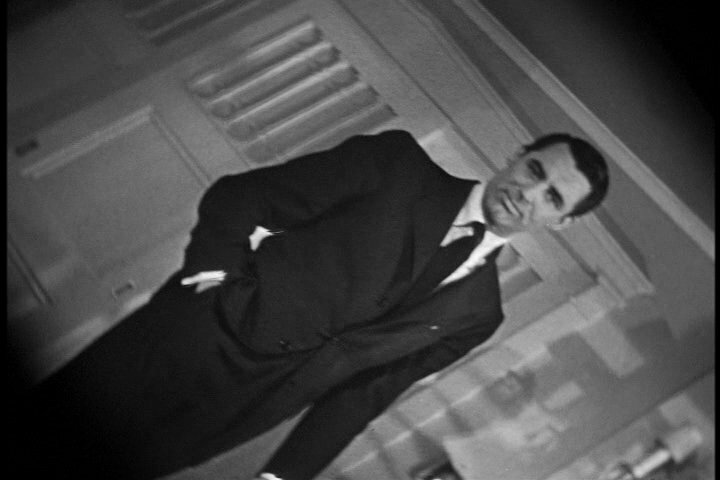 Interestingly, the situation is recalled towards the end of the film, when Grant enters a different bedroom where Bergman lays sick in a bed. 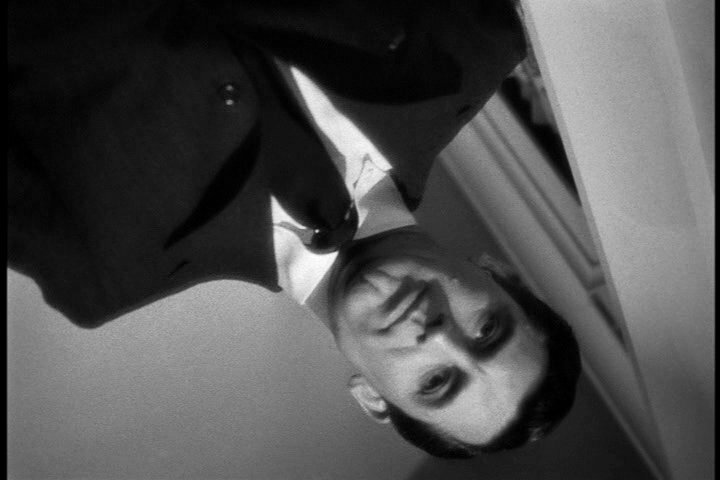 That time, the angles are not oblique, as Grant and Bergman's relationship is solidifying in that scene. Next is probably the most famous shot in the film. Again, I've got a series of screencaps below, but they don't really do the scene justice. The scene starts with a sweeping high-angle crane shot that pans across the room, then pushes down towards Bergman's hand, which is holding the Unica Key (the key that will open the wine cellar, where it is thought that the villains have hidden something). 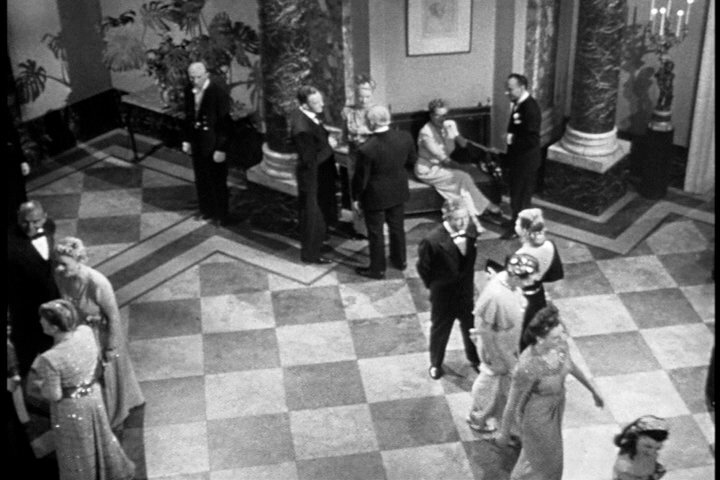 The high angle of the shot reveals the characters on a checkerboard floor, thus likening the film to a chess match, where the characters are mere pawns. This, of course, has duel meanings. 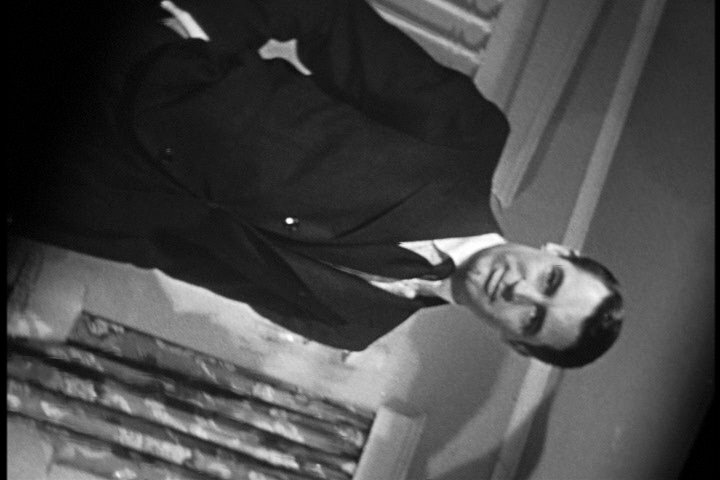 The story revolves around Bergman's relationship with Grant, but the film employs a spy plot in which American intelligence has recruited Bergman to spy on Nazis. So, in a sense, the people involved are really just pawns of war. In another sense, because the shot calls attention to itself, it is clear that the characters are also pawns of the filmmaker. On a commentary track from the Criterion Collection DVD, film scholar Marian Keane notes. The shot demonstrates Hitchcock's supremacy as the author of the film, and does so by revealing the camera's presense; its magical ability to move freely in a house where such freedom is prohibited. And that in Hichtcock's hands, the camera is capable of revealing his intentions, hence his presense behind it. As previously mentioned, Bergman has stolen a key off of the villain's keychain. They key is to the wine cellar, and Grant wants to see what's hidden in there. 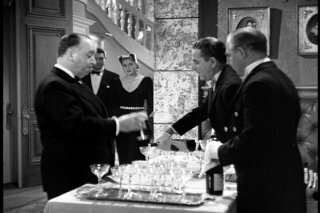 Hitchcock employs a brilliant plot element to heighten the tension of these scenes: they are at a party, and the champagne is flowing freely. Perhaps too freely. They might run out, thus necessitating a trip to the wine cellar to fetch some more. But the moment this happens, the villain will be aware that someone has stolen his key. Towards the beginning of this sequence, Hitchcock makes one of his infamous cameos. Typically, when a director makes a cameo, it's seen as a bit of an egotistical thing. Perhaps it is, but in this instance, Hitchcock brilliantly imbues it with a double meaning. As Bergman and Grant move towards the bar to check on the champagne supply, we catch a glimps of Hitchcock downing a glass himself. It's as if he's telling us that he's not going to take it easy on his characters, and that they had better get a move on if they're going to successfully find out what's in the wine cellar. Of course, the villain notices that his key is gone, and later that night, he goes down to the wine cellar to investigate. 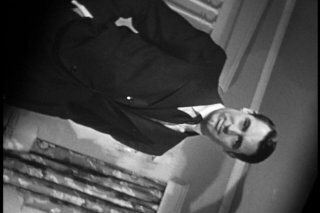 Grant and Bergman had accidentally broken a bottle that contained a suspicious powder (which we later figure out is uranium), then hastily cleaned it up as they had to leave the room quickly to avoid detection. Later that night, our villain sees nothing wrong... but decides to look closer. He scans the wine bottles on the shelf. The camera moves from bottle to bottle, displaying a finger and a year. The first several bottles say 1934, but eventually we get to one that is out of place, a 1940 bottle. This is the sort of thing that bad cinema would avoid, favoring lengthy exposition about how the Nazi's employed a labeling system for all their work and that looking at the years would confirm whether or not they had been tampered with. 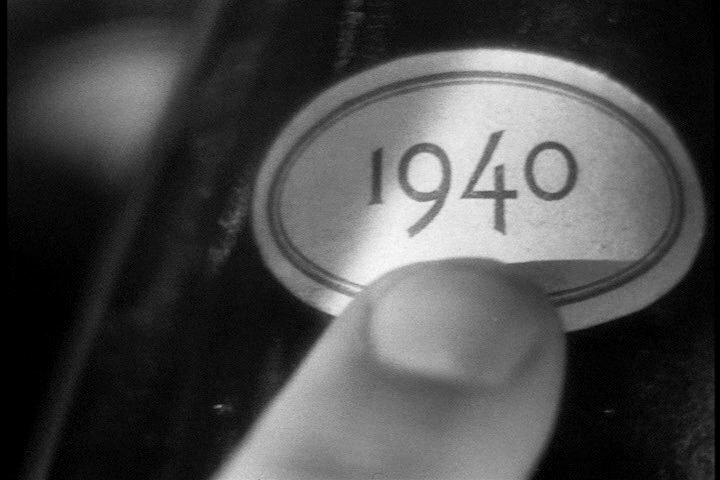 Instead, Hitchcock simply shows us the years, and we figure out what he's looking for. 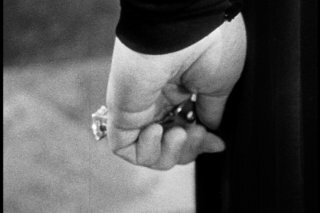 Of course, there are many other famous shots in the film (such as the first appearance of Madame Sebastian), but I don't have time to go through them all. This film will most certainly end up on my Top 100 list, when I get around to creating it. Last week, I listed a bunch of films I wanted to catch up with before I compiled the top 100 list. I was a little unsure if this was a good idea, though, as great films usually get better with repeated viewings. Would I really find something worth putting on the list after a single viewing? Well, Notorious certainly fits the bill. Of course, I've watched it twice this weekend, and I've watched some of these scenes several times while writing this post, but what do you expect from a truly great film that I loved. It's perhaps not totally perfect, but it's close, and the story hangs together much better than Hitchcock's earlier works (see my Hitchcock category archives for more). To be sure, the spy story is a bit contrived, but the important thing isn't the spying or the Nazis or the uranium, it's Bergman and Grant's relationship. The rest is just window dressing (what Hitchcock infamously refers to as the MacGuffin). There were already 4 Hitchcock films on my preliminary top 100, so this would make 5. It's possible that a sixth will emerge as well, though I think that if that happens, one of the initial 4 will be driven off the list. We'll see, I guess.